LOOKING to live an active coastal lifestyle but don’t want to live among the hustle and bustle? West Beach’s shoreline border is not yet thick with retail hot spots, cafes and pubs like some neighbouring seaside areas, giving it an even more relaxed feel. 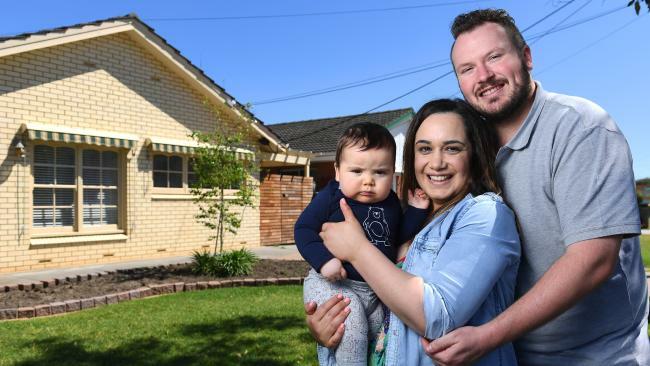 Vanessa and Matthew Costalos, (pictured with their son James) have enjoyed living near the beach for three years but are now selling their two-bedroom duplex in Prinse St.
“We are moving because we need a bigger home for a growing family,’’ says Mr Costalos. Mr Costalos says West Beach is central to everything in the western suburbs. “You can be at Semaphore or West Lakes in 15 minutes, to Port Adelaide in about 20 minutes or head south to Brighton in about 15 to 20 minutes and Glenelg in 10 minutes,’’ he says. Harbour Town (with Woolworths) and the Drake supermarket on Burbridge Rd are closer, with the latter open to 10pm. “This is a pretty neighbourhood, close to the beach, the airport and the city,’’ Mr Costalos says. “The lifestyle is great here. “It’s a nice, quiet suburb. “Everyone is friendly and has a wave when they see you,’’ he says. West Beach also has lots of parks such as Apex Park (Burbridge Rd) with playground and tennis court facilities. “It’s only a five to 10 minute walk to the beach from home,’’ Mr Costalos says. The median house price has risen more than 18 per cent in the past three years. Sales agent Joanna Manolakos of Ouwens Casserly Real Estate says West Beach is attracting younger families. ‘‘And the beach is a little more private than at Henley or Glenelg,’’ she says.